If you have ever tried moving to a new home or workplace — especially, if you are bringing along an entire family or business — without the help of a moving service, you would know how difficult it is. In fact, you would most likely think that the moving service fees you saved are not worth the additional time and effort that you had to put in. Truly, when you move, you are not only starting a new beginning — you are also starting a journey that puts your time, possessions, and even safety on the line. And the moment you must have thought of this the most is when you tried to walk the plank juggling an obscenely heavy couch, just to get it to that waiting moving van you rented. Despite this realization, there will always be the urge to save, especially in this economy. Since this is the case, it is time to turn to another, more cost-effective tool that has done wonders in moving and storage — portable storage containers. 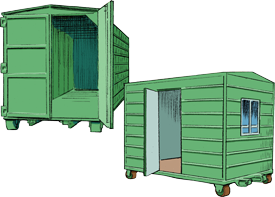 These containers are the simplest and yet most versatile solution to the problem that has been there ever since man decided he needed to be somewhere else. These storage containers are large steel (also plastic or wood) boxes that are specially made to keep your valuables secure. They are made to be at ground-level, making the loading and unloading of heavy appliances easier. These are also sturdy and watertight, with an additional layer of protection making it truly weather-proof. And of course, you hold the key throughout each step of the way, making sure no one can tamper with your life’s investments. it is important to make sure you know how to optimize the space. Depending on the container size you are renting, storage containers can generally carry from 1,000 to 3,000 cubic feet of items. 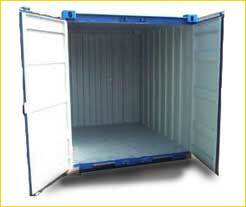 This means a single box can give you a few room’s worth of space. When arranging, start with the heaviest appliances — your refrigerators, wardrobes, washing machines, dishwashers, gas ranges, etc. These will be the “base” of your packing. Try to keep them together as much as possible, and use the loading straps to secure the sections. Remember that storage containers are highly customizable, so you can have these attached if none are originally provided. Next, load the boxes in between the unfilled spaces. This will be your second section, ensuring that the items do not shift around along the way. Make sure that these boxes are completely filled. You may use paper or bubble wrap to pad the items when needed. Lastly, load the lighter items at the top. Make sure to always stack from the floor of the container all the way up to the ceiling. Load the mattresses last as a means to provide the overall load some added stability. Following this technique, using your storage container should be a breeze. Of course, make sure to ask the company you are hiring what amenities their boxes offer — you may opt for add-ons such as translucent roofs, modified doors, and the like. The storage container industry has been a very competitive market for quite some time, despite it being carved by essentially a single company. In the end, it will be up to you to look for a service provider you can trust for those moments of the journey when the container is not in sight (you wouldn’t want to worry, would you?). Also, experience and customer service can weigh far more than any technical aspect attached to the boxes themselves. Posted on September 16, 2016 October 25, 2017 Author Brian JonesCategories UncategorizedTags How to customization storage containers, portable storage containers, Who give Loading tips for storage containers?